tattoo virgin, that is!!!! Come on, I have two kiddos already and have plenty of witnesses that know I was seriously pregnant and gave birth to them myself, not to mention Mike and I are about to celebrate our 11th wedding anniversary this October. Orchids can impart a wide variety of messages, but historically the meanings of orchids have included wealth, love, and beauty. To the ancient Greeks, orchids suggested virility, and after the rise in popularity of orchid collections in Victorian England, the meaning of orchids moved towards being symbolic of luxury. Orchids have also been believed to carry various healing and protective properties, allowing them to ward off disease. The Aztecs were said to drink a mixture of the vanilla orchid and chocolate to give them power and strength, and the Chinese believe orchids can help cure lung illnesses and coughs. 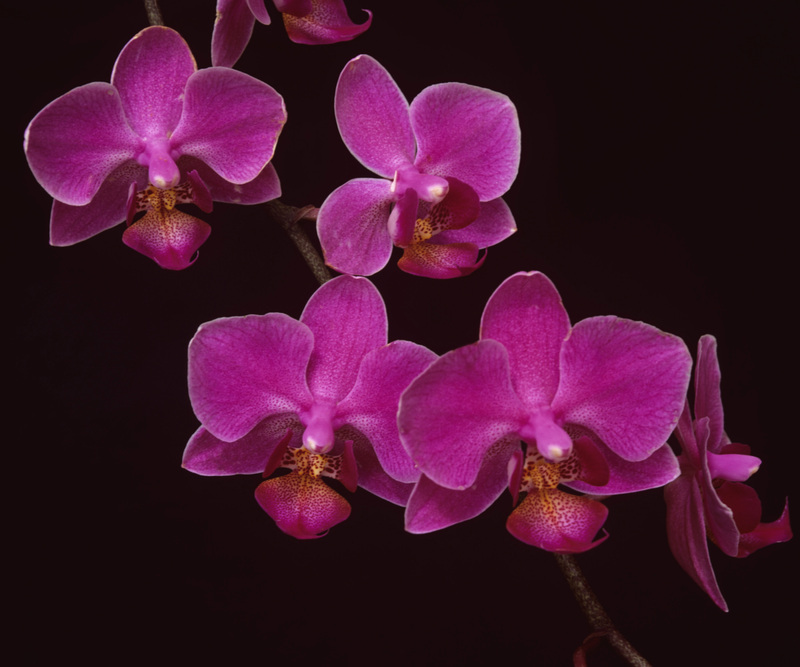 Today, the meanings of orchids are generally regarded as a symbolic of rare and delicate beauty. I thought this is perfect. So the search began and it ended pretty quickly with the below picture, then it was to decide placement. With help from a very close friend it was decided the outside ankle would be best, not sure if left or right is better or if that even matters. I plan this fall to get my first tattoo! I am so excited. Once all in the house sleeping, except the mama (unless I decide getting up early is better to think, lol), I plan to compile our new budget and this will determine if the tattoo will happen in September or October. After waking at 7:30 am, showering and actually remembering to take laundry downstairs with me to do, I have accomplished my required routine for the day. WOO HOO! My morning started out with officially drinking a half of a pot of coffee (through our the morning, not all at once), taking my vitamins, feeding the dogs (and taking them out) and doing the dishes. I checked email and Facebook. Then it was breakfast time. While enjoying my cream of wheat I was able to sit and enjoy Good Morning America, which is something I don’t get to do often. Usually breakfast is accompanied with cartoons. It was great getting some mommy TV time. Next thing I know is Ms. Alaina appears, she is in a great mood and all and before you know it Mr. Thom is calling me saying ‘Mommy I Awake!’ So cuddle time began and so did mommy slowly drifting off to the ZZZZZ land (at this point I only had about 1/4 pot of coffee in my system) to only be awoken to ‘Mom can you put on cartoons’ from Alaina. Right then and there I had to decide what kind of face was going to put on. I knew that I currently did not have the correct face. So it was time to change it up. I made the kids breakfast, folded laundry (along with having one more load in the washer and dryer, so that is 3 loads total already) and the kids dressed, it was time for mommy to get her behind in gear. First on the list was to turn the TV off. Once that was accomplished the kiddos dug out the Mr. 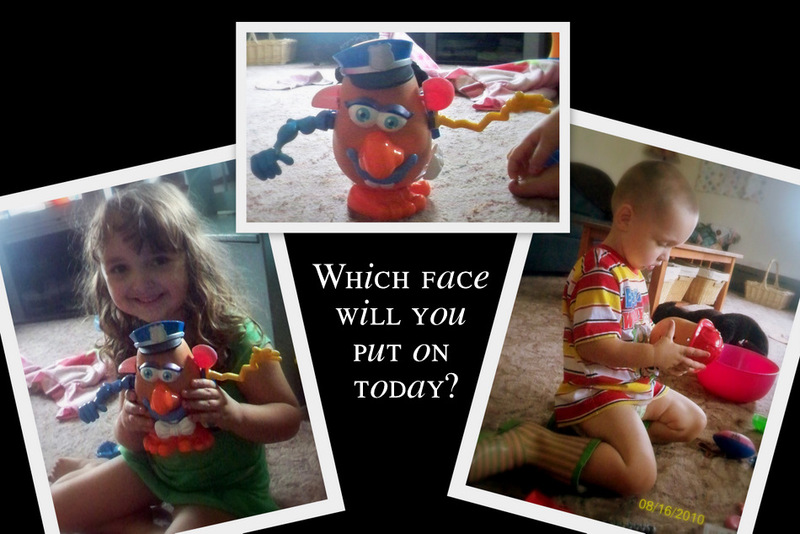 Potato Heads, I thought how appropriate. If you don’t like his face you just change it. While they played, I finished cutting out my coupons. They are not organized and I will work on that later this week, they are at least cut out. We had lunch and then it was NAP TIME. It was workout time, which I completed with out complaints. I also have supper in the fridge ready to go for when Mike gets home. I just need to cook the ribs, which are marinated in Zesty Italian Dressing, make the string beans (from our garden) and some potatoes. I am hoping for a wonderful peaceful evening with the family. Then tomorrow I will be at work again. So that means my routine will not happen tomorrow, so wish me luck that on Wednesday I can get back on track.